by Darwin Gillett, published in 2008 by Cosimo Books (NYC). To build and lead successful companies, corporate leaders and business owners need to tap the full range of human knowledge – and spirit. 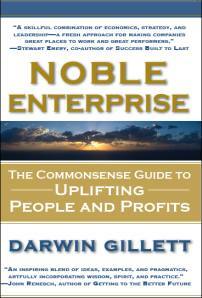 NOBLE ENTERPRISE provides insights and guidance that help them do just that. It includes the inspiring story of one company’s dramatic turnaround. The Noble Enterprise model is a proven approach that every corporate leader and business owner can use to achieve sustainable growth and prosperity. Published in 2004 by Mission Publishing. 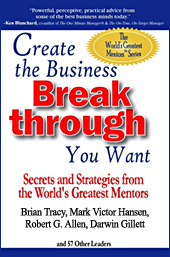 Written by Brian Tracy, Mark Victor Hansen, Robert G. Allen, Darwin Gillett and 57 other leaders. 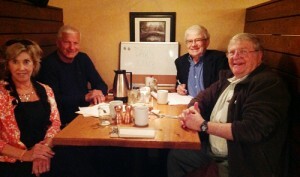 Ken Bardach, creator and improver of executive programs at several leading business schools – and now designs executive programs in U.S., Europe and South America, teaching some of the courses himself. Karen Jeisi, an early female leader in corporate America, including as a member of the Board of AT&T Canada. Now teaches leadership at several graduate business schools – plus provides leadership in several not-for-profit organizations. The team is identifying and addressing the major “paradoxes” that leaders face, and articulating strategies that leaders can use to successfully deal with these paradoxes. Stay tuned for more information. Use the box at right to sign up for email updates if you’d like to be informed when this Leadership Guide is published.